Injuries are mounting as the clock winds down. Over the last two weeks, Tim Hardaway Jr., Robert Covington, Kelly Oubre, Derrick Rose, Jeff Teague, C.J. Miles, Lonzo Ball and Brandon Ingram were officially designated as out for the rest of the season. Malcolm Brogdon and Dante Exum can almost certainly be added to that list, while Nikola Mirotic’s injury could end his regular season if his recovery is on the slow side of the two-to-four week timetable. It’s almost impossible to have a roster that escaped all that carnage unscathed. Even if you did, all those injuries have shaken up a lot of rotations, creating tons of opportunities across the league. Week 24 is another light week, though the schedule is less balanced than the last several. Monday and Wednesday have only four or five games, while Tuesday has 10. Pickups who play on Monday, Wednesday — or both — therefore have increased appeal in daily lineups leagues, while pickups who play Tuesday are slightly less valuable. The Grizzlies, Thunder, Suns, Trail Blazers and Jazz play on both Monday and Wednesday. The 76ers, Pacers and Warriors play on either Monday or Wednesday and do not play Tuesday. The Knicks, who are the only team with a two-game week, don’t play their first game of the week until Thursday. Just nine teams play four games: The Nuggets, Clippers, Lakers, Grizzlies, Thunder, Magic, Trail Blazers, Kings and Wizards. The Grizzlies, Thunder and Trail Blazers all both have four-game weeks and play Monday and Wednesday, making them the best teams to target for daily lineups leagues. As always, this article will focus on players available in at least 50 percent of leagues. Players are listed in the order I’d recommend them, assuming all are equally good fits for your team. I’ve mentioned multiple times this season that the best way for fantasy managers to adapt to the three-point boom is to effectively create a medium-term streaming spot to freely add (and drop) whichever long-range bomber is hot (or cold). 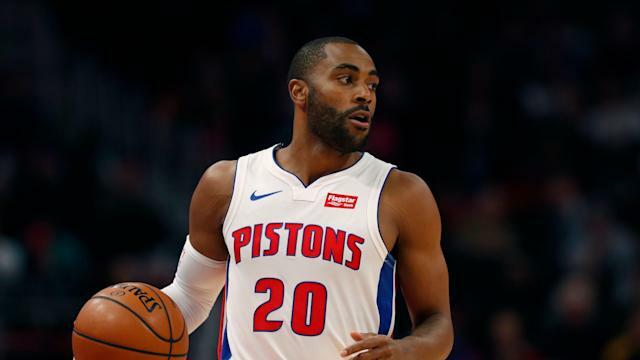 This week, the Pistons’ pendulum has swung back from Luke Kennard to Ellington. He immediately stepped into the starting role after joining the Pistons but he started slow, averaging single-digit points and shooting just 35.7 percent from behind the arc — pretty bad for a career 38.2 percent sniper. Well, the Pistons stuck with him, and he’s righted the ship. Not only does Ellington have 13 threes in his past two games, but he’s averaging 3.7 per game on 48.1 percent three-point shooting over his last seven. Historically speaking, once Ellington gets hot, he can stay hot for more than a month at a time. Kelly Oubre (thumb) is out for the season, and the 32.9 minutes, 20.2 points and 16.0 field goal attempts per game that he’s averaged since the All-Star break won’t just disappear into the ethos. If T.J. Warren (ankle) ever returns, he might inherit some of Oubre’s load, but he may soon join Oubre with the “OFS” tag. Don’t get me wrong, I’m no big fan of Josh Jackson, but he is the guy who will see the most benefit. While his advanced metrics are hilariously terrible — he’s not even one of the top-five Jacksons in the league by win shares or win shares per-48 minutes — fantasy is won on raw production. When Jackson has played at least 30 minutes this season, he averages 16.9 points, 5.7 rebounds, 3.5 assists, 1.4 steals and 0.9 blocks. His efficiency and turnovers in those games leave a lot to be desired, but they aren’t devastatingly bad. All this assumes that Jackson is healthy after leaving Thursday’s game early with an ankle injury. The Suns play Saturday and Monday, so hopefully we’ll have some useful information before weekly lineups lock for Week 24. If Jackson is out, then look for Richaun Holmes (6 percent rostered) to become a highly effective addition. Holmes isn’t always worth using in fantasy, but he’s had several lengthy stretches throughout his career of high-impact production. When those come, he provides a little bit of everything (except threes), with particularly strong blocks and steals numbers. Most recently, during a two-week stretch in January, he averaged 12.9 points, 4.7 rebounds, 2.1 assists, 1.1 steals and 1.3 blocks. Earlier in the season, he had a longer run that included less scoring and assists, but 2.0 blocks and 1.0 steals. Josh Okogie (12 percent rostered) is the more popular pickup right now after two monster games earlier this week. While Jones’ week has been less dramatic, he’s still the priority pickup after Derrick Rose (elbow) and Jeff Teague (foot) were officially declared done for the year. Both Jones and Okogie are likely to see increased minutes and responsibilities, but Okogie joined the starting lineup back on January 2 and was averaging more minutes than Jones, so Jones is experiencing a more significant change here. Jones has already taken over as the primary point guard, averaging 6.2 assists and seeing a drastic increase in his usage rate since Rose and Teague went down. Okogie is a solid consolation prize and a worthy pickup, but for most roster builds, I’d strongly prefer Jones. The two hardest stats to find are always assists and blocks. Well, (30 for 30 voice) what if I told you that you could have a pile of assists, for free, and it wouldn’t hurt the rest of your roster? Ok, maybe I’ll need to work on the phrasing, but you get the idea. Augustin is a perfectly capable point guard, steadily averaging 27.7 minutes, 5.0 assists, good shooting efficiency and good-enough rebounds and threes all season long. He’s been boring, but — at least in hindsight — a bunch of managers would have probably been better off had they just held Augustin all year. Increasing his appeal, he’s been on a bit of a tear lately, increasing his assists to 7.2 over his past five games, while also boosting his threes and steals. If you’re chasing assists, you’ll have a hard time finding better options than Augustin or Tyus Jones.